The series won the 1987 Animage's Anime Grand Prix Award. Saint Seiya was one of the very first anime series I watched as a young kid. Being that I might've had a bias towards this anime, I decided to watch it again not very long ago. While I admit this series is not as good as I remembered it, I belive it is still worth watching. Saint Seiya had a brief run on Cartoon Network, but due to its violent content, it was moved to a very poor time and gradually lost any attention it received. If you followed it while they aired it or if you are just curious, I encourage you to give it a try. The story follows the following paradigm: Athena, with the help of the zodiac saints, protects the Earth from the other gods whose wishes are only to do away with humanity. The use of Greek mythology is vastly employed throughout the story as other gods such as Poseidon and characters such as Medusa make appearances. While that may sound quite simple (and it is very much straight forward), the characters undergo a thorough process of development. With each fight they seem to acquire more knowledge and powers that help them mature from teenagers to men. The themes of friendship, loyalty and endurance are some of the most explored throughout this anime. The bond that ties the saints with Athena is mere responsibility at first, but extends itself to friendship and love. Regarding action, there is plenty of fighting from beginning to end. At first the matches are part of a game, but later on they develop into life and death situations. As the series progresses, the saints also acquire more power, which makes the fights all the more interesting. I do have to warn you, though, since there is quite an amount of death and blood throughout these fights. When it comes to animation, it shows that the the series was made in the 1980's. For its time, and even compared to some more recent anime, the animation is quite decent. I have no complaints about it. The OST fits the series very well. Most of the tracks help convey the series' feeling of the larger-than-life plot and battles in the entire story. I believe they did a phenomenal job here. One last comment I'd like to make: This is not another dragon ball z. While there are some similarities, there is more involvment of more characters than in dbz (it doesn't always come down to helping the main character do everything). Saint Seiya is a shounen that features several elements of mythology (mostly Greek mythology) and astronomy (constellations). The main characters, the Bronze Saints (knights), are responsible to protect goddess Athena and the humanity against the evil gods. The fights are generally interesting, specially because the majority of the characters have a badass aura around them. On the other hand, they are more static than in other anime of the same genre, mainly because of the few techniques used by the Saints/knights. The story is quite simple for the most part, and goes in a very monodimensional way, but it is solid. Although the main focus of the plot is the war between Gods, the plot of the first arc revolves around the consequences of the Pope’s betrayal in Athena’s Sanctuary. The first episodes feature the Bronze Saints fighting each other in the highly used but never old “tournament system”, competing for a very desired prize: Sagittarius Gold Cloth. After the introduction of the main characters, Sanctuary arc really starts. We are introduced to a corrupted Pope, a man who should profess Athena's wishes, but uses Athena's soldiers to his evil intentions. The Pope sends the Silver Saints to kill the Bronze Saints with the excuse that they deviated from their path. Some of the Sanctuary Saints know about the Pope’s evil intentions, others not. It’s valid to say that it takes some episodes to reveal Athena's true identity. The same thing for the Pope. It also takes some episodes for the Gold Saints appear. They are the strongest Athena's soldiers. After this small summary, I tell you that Saint Seiya is a very entertaining anime, but it may have not aged well for the newer audience. I really don't now if it will please people that are only into modern days shounen. Also, as I said, there are a lot of faults in the anime story when you compare it with its manga. So I wil tell some of them in the next lines. The anime has some features that are superior than the manga, like the art in general, especially Character Design and Clothes (armors). But the studio also created a lot of filler characters: some of them has not even a category (Bronze, Silver or Gold) or a constellation well defined. There are also the total unnecessary Steel Saints, that have good-looking armors, but fight just using mechanical weapons, without cosmo (chi). They appear in some episodes at the beggining, but then they vanish without any explanation. Other big difference is that Hyoga is disciple of Camus in the manga. In the anime, Hyoga is disciple of Crystal Saint. And Crystal Saint is disciple of Camus. This will have a significant implication in the future arcs (reveal more than this would be a spoiler). The 12 Zodiac Temples Arc starts well, following the manga as much as possible, but the final fight is very different. After this part, there is a whole filler arc, the Asgard arc. It features new enemies: the God Warriors. The armors and personalities of the enemies are very well made and solid for a filler. But fillers always have some fault: the God Warriors were made so strong, that they somehow overshadow the power of Marinas (from the following saga, cannon material). This anime ends in the Poseidon arc, and has its sequel in Hades Chapter OVAs. Saint Seiya's songs are very, very good. The quality of the animation decreases in some episodes but it can be considered generally satisfactory if you take into account the time it was made. The character design, as I said, is way better than in the manga, especially the Clothes (armors). Pegasus Seiya (impulsive and obstinate); Shiryu (calm and rational); Hyoga (sometimes hesitant, but rational when fighting seriously); Shun (kind-hearted, peaceful and emotive); Ikki (antihero, independent and secure). All this characters are orphans who grew up together. But the singular relation between them is better justified in the manga, where they are all brothers. Other saints I must highlight are the Gold Saints. Each Gold Saint represents one of the signs of the zodiac, sometimes even in powers and personalities, though some of them must be a little stereotyped. Most of the enemies in the series are fairly developed for an 80's anime, as they usually have a background story and a meaning to fight that takes the story beyond the good x evil plot. 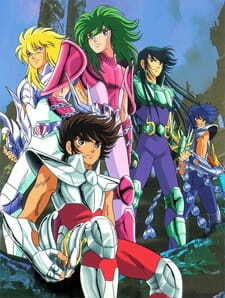 I am suspicious in praising Saint Seiya, since it was my first anime, so it was very important to my childhood. But I can recommend it to those who like old-school anime, since it may be dated to younger viewers. I also recommend to read the manga, if you have time and want to better understand the story. The art is worse, but the plot works better. Let me start by saying that this was the very first anime I watched complete. Truth is I was really young when I watched it the first time, but just recently when new OVAs came out I watch it once again. Basically the story follows a group of 5 "Zodiac warriors" of Athena in their mission to save the world from the "evil" gods who want to destroy it. The anime heavily relies on Greek mythology, so the story follows a path trough Olympian’s gods. The story is really absorbing and exciting, the fact that the 12 zodiac signs appears as a main part of the story sets the mood for a more personal and deeper involvement in the story (who doesn't want to watch he's own Zodiac sign win??). Whilst the animation is not up to what we are used nowadays, it’s quite decent for its time. The sound is decent but just that. And the characters are well built. But what makes Saint Seiya stand alone, is, its art. Every warrior is based upon a constellation, and every warrior has his unique armor. Somewhat around 100 armors are displayed trough the anime. So I really recommend this anime if you are interested in watching a cult anime, with really cool art, average animation, and a no so deep story arc. The animation for this series is obviously going to seem dated because of the poor frame rate and some jerkiness in its presentation. However new masters have been made available recently and I had a chance to get a look at them. Overall, it has stood the test of time fairly well. The only things that might be a problem for some viewers are the (as mentioned above) poor frame rate, repeated footage but also the fact that some episodes have inconsistent artwork. Overall, these series has beautiful character designs for both the boys and the girls AND some beautiful backgrounds to match. It's just that some episodes reflect those better than others. Of course, at the time the series was made and with the demand for more episodes, its fidelity to the art is amazing. It does not make the characters look cheap so that they stay on budget. This already makes it better (animation wise) than later shows like Ranma or Naruto where the quality just drops as the series progresses. In the second and third series of Saint Seiya (criminally not given their own sections by most sites) the animation quality raises a bar. The artwork looks a lot cleaner and sharper. The saints are given better armors (or cloths) to fight in. The backgrounds are even more detailed (the Asgard series just looks breathtaking). The sound of Saint Seiya is made up of JRock intros, JPop outro and symphonic compositions within the episodes (with vocals on some tracks). Overall, this gives the series a magnificently epic feel as all types of music are produced incredibly well to suit the mood/s of the show. Soldier Dream is the stand out vocal track for me. The stand out composition in a sea of greatness is Athena's Theme. The only reason I did not give sound a 10 is because these symphonies are reused a few times and as lovely as they are to hear, I just kept wishing for more of them. This does not mean the series is a one trick poney as it does have about 13 soundtracks at last count. The story is what will get you into this series as first. As the synopsis describes it is about a war for humankind (yeah I know, a cliche in today's anime climate but not so much at the time it was made). The interesting thing about this though is that it uses mythological aspects to move the story along. A lot of mythologies are explored, with the obvious ones being Greek, Norse and Bhuddist. The saints themselves wear armors that are derivative of mythologies but in an astrological sense. Like Seiya having the Pegasus armor, Shun having the Andromeda armor or Algol having the Medusa armor. The best thing about the story is how it manages to keep a lot of mysteries to itself in the first series (the Sanctuary Arc) as you do not know if the protagonists are actually right until about episode 50. Preceeding episode 50 are wonderful episodes that develop the characters so well that its climax just moves you to tears. The second and third series have different stories that are persued but despite the length (25 and 15 eps respectively) they still maintain the epic atmosphere and have some of the most touching characters in all of anime. The characters in the Asgard series are probably the best antagonists (as a group) that anime has to offer. They are marvellously well developed so that you feel their triumphs and failures like they were transcending you. Mime, Fenrir, Thor and, Syb and Bud are the best of that cast and their respective stories have the potential to move you to tears (Think Now and Then Here and There). The best part of it is how they actually affect our leading team of five (Seiya, Shun, Shiryu, Hoyga and Ikki) which makes them connect with us even more. The main five are also very successful characters. Of them my favourite is Shiryu because of his values and willingness to sacrifice himself. Shun and Hyoga are close seconds as they have interesting backstories and a powerful bond. Ikki has a very interesting personality that is developed very successfully as the series goes. Seiya, although the main, is my least favourite of the five as he is a little childish and annoying (yet, still well developed). I have grown to like him a lot more with the newer releases of the series though. The great thing about this series is that you are sure to connect with at least one of the characters as there are quite a few of them and, even ones that don't feature for very long have enough of a story that you don't feel they are a waste of time. The sanctuary arc has Aphrodite, Camus, Shura, Saga, Shaka, Shaina, Cassios, Aiolia and Aldebaran as stand outs for various reasons I do not want to spoil. The poseidon arc has Krishna, Scylla, Lymnades, Canon and Poseidon himself to keep you interested. All these characters are so well done that some of their characteristics have become cliches. So you should watch Saint Seiya to see where it all starts. I own this whole series and it a definitely a must see. If you're unsure as to whether you will like it, ADV Films is releasing an affordable thinpak with the first 30 episodes for you to decide whether it is your cup of tea. Also try www.rightstuf.com for good deals on the singles. I think they are something like $5 at the moment for 5 episodes a disc, which is amazing value. I thoroughly enjoy this show everytime I rewatch it as a whole or in parts so I think all of you shounen fans will find something to like too. The chracter design also allows for a few bishounens so the girls are thought of as well.